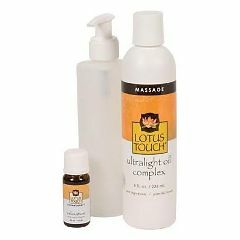 Lotus Touch UltraLight Oil Complex* is a unique massage oil which combines the light, fluid texture of seed oils to give you the effortless slip and glide. Lotus Touch Relaxation Aromatherapy Blend* is a woodsy, sweet and fresh aroma that encourages a state of deep relaxation. Key therapeutic grade essential oils includes sandalwood, petitgrain and tangerine. Create custom aromatherapy massage products easily and economically. Simply, blend 10 drops per ounce of lubricant and apply to your client.